Last Friday, Health Canada released new measures the agency claims are intended to protect bees from exposure to neonicotinoid pesticides. As with recent regulations proposed by the U.S. Environmental Protection Agency (EPA), beekeepers and environmental groups are criticizing the measures as inadequate, not going far enough to protect domesticated honey bees that both in Canada and the U.S. have seen losses of over 30% each winter since 2006. Ontario beekeeper Dave Schuit told the CBC, “Basically I see it as a Band-Aid. [The Pest Management Regulatory Agency] should’ve done their study before they approved this pesticide.” Dave Schuit owns Saugeen Country Honey Inc., and reportedly lost 37 million bees last year – more than half of his over 2,000 hives – as a result of exposure to neonicotinoid pesticides. Health Canada also indicated that the agency will be updating the labels for neonicotinoid pesticides similar to EPA’s recent requirements. However, there is widespread concern that the new label language is unenforceable, and unfairly puts the onus on beekeepers to make sure that their bees are safe. Neonicotinoid pesticides are systemic, meaning they are taken up by a plant’s vascular system and expressed through its pollen, nectar and guttation droplets (sap exuded from the tips and edges of plant leaves). Studies show that bees which forage on neonicotinoid treated plants can accumulate the pesticide in their hive at levels that impact the colony’s ability to thrive. Honey bees exhibit reduced foraging, learning, and navigational behavior when exposed to even low levels of neonicotinoids. Neonicotinoids have also been observed to suppress bee immune systems, making them more susceptible to pathogens and disease, ultimately reducing the health and long-term viability of the colony. An extensive overview of the major studies showing the effects of neonicotinoids on pollinator health can be found on Beyond Pesticides’ What the Science Shows webpage. The robust evidence of the wide ranging harm neonicotinoids cause to pollinators led the European Union to ban the use of these chemicals in agriculture for two years. Late last month, agrichemical giants Syngenta and Bayer announced that they would be suing the E.U. over their decision. As Health Canada’s announcement indicates, the agency is “expediting” its re-evaluation of neonicotinoids in coordination with EPA. It is unclear what the agencies mean by expediting, as EPA’s registration review work plan for the neonicotinoid clothianidin indicates that a decision will not come until at least 2018. Beyond Pesticides has worked with allies, including beekeepers and environmental groups, to get EPA to respond quickly to the pollinator crisis through legal petitions, and declare the pesticide clothianidin an “imminent hazard” to honey bees. After EPA rebuffed our petition, the coalition filed a lawsuit in Federal District Court against EPA for its failure to protect pollinators from these dangerous pesticides. 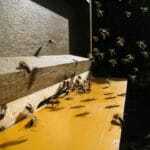 The lawsuit seeks the suspension of the registrations of the neonicotiniods clothianidin and thiamethoxam, which have repeatedly been identified as highly toxic to honey bees, clear causes of major bee kills, and significant contributors to the devastating ongoing mortality of bees known as colony collapse disorder (CCD). The suit challenges EPA’s oversight of these bee-killing pesticides, as well as the agency’s practice of “conditional registration” and labeling deficiencies. In early July, Beyond Pesticides urged President Obama in a joint letter to direct EPA to follow Europe’s lead in suspending certain neonicotinoid pesticides uses and take on even more protective measures, including a minimum two-year suspension for all outdoor uses of neonicotinoid insecticides pending resolution of their hazards to bees and beneficial organisms. A recent report from Beyond Pesticides and Friends of the Earth-US shows that common outdoor plants often touted as “bee-friendly” by retailers such as Lowes and Home Depot contain concerning levels of neonicotinoid pesticides. Additionally, a U.S. bill introduced by Representatives John Conyers (D-MI) and Earl Blumenauer (D- OR) titled the Save America’s Pollinators Act would suspend the use of neonicotinoid pesticides before a full review of scientific evidence and a field study demonstrates no harmful impacts to pollinators. You can tell your member of Congress to support the Save America’s Pollinators Act here. With one in three bites of food reliant on bees and other beneficial species for pollination, the decline of these important species demands swift action. The mounting scientific evidence, along with unprecedented annual colony losses at 30 to 90 percent this year, demonstrates the impacts that these pesticides are having on these fragile beings. Join us in asking Lowe’s and Home Depot and other leading garden centers to take action and stop the sale of neonicotinoids and plants treated with these chemicals. Tell your member of Congress to support the Save America’s Pollinators Act. Sign the Pesticide Free Zone Declaration and pledge to maintain your yard, park, garden or other green space as organically-managed and pollinator friendly. Use our model resolution to transform your community and raise awareness about pollinator health.